the new five priorities for the care of dying people, replacing the Liverpool Care Pathway in care in the final days of life. Most healthcare professionals, especially GPs and primary care providers, are caring for people nearing the final stage of life. About 1% of the population are in the final year of life (that equates to about 20 patients per 2000 list size for every GP) and with an ageing population's increasingly complex needs, the challenge of caring for people in the last years of life is becoming more apparent. So not only do we need to 'be there when it happens', but also we are being asked to face the challenge more proactively and take a broader population-based view of this growing number of patients, to plan ahead and to anticipate the care they need before they need it, where possible. But end of life care is also about care for the living, and their families or carers. The aim is to help people to live out the final years of life as well as possible and when the time comes, to support them to die well also, in the place and manner of their choosing. An ageing population brings many challenges to healthcare professionals, who are caring for more people with more complex conditions, multi-morbidities, dementia and frailty, with decreasing numbers of informal carers and tightening financial resources; all this has an impact-on healthcare and social care providers. Care for people nearing the end of life also incurs considerable financial costs: with tightening budgets, it is important to consider how we can make best use of scarce resources by reducing unnecessary hospitalisation, interventions, over-treatment, crisis care, and waste. In addition, with improving technological expertise, we are now facing the stage of a new 'tipping point': 'Just because we can doesn't mean we should.' There is always a crucial balance to be struck between quality and quantity of life, between over-treatment (over-hospitalisation of care and over-medicalising of the dying) and under-treatment, but the one constant is the need to give effective, supportive care in line with people's preferences; by working with specialists and others, primary care plays the most important part of all by leading on the crucial orchestration and coordination of care. However, as demands increase, how can we meet the looming challenge without being overwhelmed? A person dies in this country roughly every minute, and about 1% of the population dies every year. 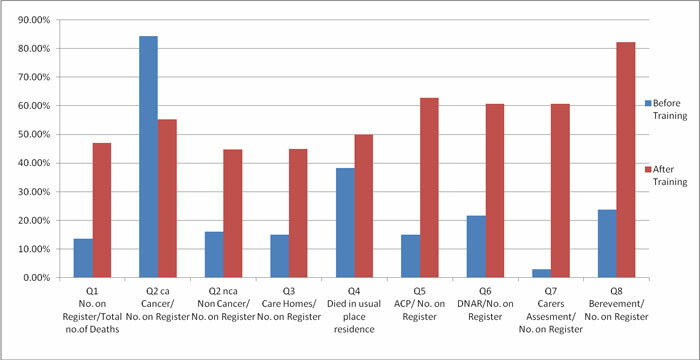 The overall number of deaths was predicted to increase by about 17% from 2012.2 Recent evidence confirmed the startling finding that about 30% of people in hospital at any one time are in the final year of life3 and an estimated 80% of carehome residents are in their final year, with many nursing-home residents living less than a year. So life expectancy and morbidity increase, while the mortality rate stays at 100%! But unlike the general population, those of us working in healthcare have been this way before with our patients and could anticipate roughly what is needed: we know what can happen, what can help, who needs to be involved, and we have ideas about how to prevent crises and emergency hospital admissions. But often we fail to be as proactive as we could be due to time pressures, repeated crises, or we are unable to predict a patient's significant deterioration. In considering commissioning for a whole population of people, we need big-picture thinking. Population-based end of life care is needed to meet the challenges of the ageing population by helping us to predict earlier and plan proactively. Everyone is involved but GPs play a crucial role, knowing what might be on the horizon, anticipating and meeting needs before they arise, and having as their central focus the wishes and preferences of the individual and their family. Our patients wish to live as well as they can in their final year or so of life, but they ask us to be a caring guide to them and their loved ones, a 'companion on the journey'. This involves a wide number of people in health and social care, including the often extraordinary and sometimes undervalued staff in care homes as well as domiciliary care workers, who play a major part, as increasing numbers of people live alone or have few or distant family members to care for them at home. If we think in terms of the population of people who might be nearing the end of life, not just those with cancer diagnoses or who are in the final days of life, we can begin to be more proactive. This is of course an approximation as no-one can accurately predict death, especially in the elderly (and people infamously belie predictions and 'do not die on time'). However, we can become better prepared for the possibility of dying, so that as patients decline we have everything ready earlier for them, and their anticipatory drugs, equipment support, and DS1500 benefits do not appear after they have died. So how can we turn the clock back and anticipate things earlier? Attempts at prognostication may be far from an exact science and more like an informed, intuitive guess. Even so, can we try to put strategies in place, to provide proactive, supportive care before people are aware they need it? That is the point of striving for earlier identification of patients in the final year or so of life and including them on registers. The General Medical Council (GMC) Treatment and care towards the end of life guidance4 provides a working definition of end of life care to include all people considered to be in the final year, not just final days, of life. This is broader than that assumed by some and includes people with long-term conditions (see the GMC definition in the guidance 'Glossary of terms'4). The well-used 'surprise question',6'would you be surprised if the person dies in the next year, months, weeks, or days?' helps us fine-tune our intuition. However, if we add the general indicators of decline (weight loss, decreasing functioning, sentinel events, etc) with specific indicators related to each condition, as suggested in the Gold Standards Framework (GSF) prognostic indicator guidance,7 then this can help alert us to possible deterioration and we can then put supportive plans in place to be ready to use them when the time comes. The 2008 NHS End of life care strategy8 and NICE quality standards for end of life care for adults5 use the broad end of life definition to include care in the final year or so of life, rather than just care of the dying in the final days. The NHS Strategy and NICE guidance build on our long history in the UK of world-leading excellence in specialist palliative care and good synergistic working between specialists and generalists, but extend the vision beyond the typical, more cancer-focused approach to include all people with any condition in any setting. Other recent significant policy developments are listed in Box 1 below. Since 2000, the GSF quality improvement programmes run by the GSF Centre in End of Life Care have had an impact in influencing policy and putting policy developments into practice.9 The original GSF Foundation Level in Primary Care was mainstreamed in primary care in the UK through QOF 2004,10 with over 95% of GP practices having a palliative care register and regular meetings to claim their palliative care points. In 2010, a comprehensive systematic review was published that affirmed the successful implementation of GSF in primary care in many areas.16 In 2010/11, the National Primary Care Snapshot Audit,17 funded by the Department of Health, described current practice in over 500 practices in England, showing that about a quarter of patients who died were included on the register, 75% of these being cancer patients, but that those identified on the register received better coordinated care. So this affirmed the good building-blocks, but that there was still more to do—we call this the Foundation Level or Bronze stage of GSF. In response, the GSF Centre developed two new programmes in 'Next Stage GSF'—the Gold and Silver programmes—to support practices to build on this good foundation and take the work to the next stage. In addition, the other GSF programmes developed for different settings and subjects, are becoming practical vehicles to improve care significantly for all—in care homes, hospitals, domiciliary care, and other settings. Taken together GSF programmes in different settings can work collaboratively, leading to better integrated, cross-boundary care. The practice-based GSF programme 'Going for Gold'18 is a distance learning programme (with e-learning or DVD) used by hundreds of practices within their teams in six modular team meetings about a month apart over 6–9 months. It is important that the whole team is involved, as nurses, practice managers, receptionists, and ancillary staff can play a key role in the success of this work. Evaluations are included both to support progress and to measure change afterwards, in particular the Key Outcome Ratios, After Death Analysis, and Organisational Questionnaires demonstrating significant change over the programme. In addition, the new GSF 'Silver programme' is briefer and involves two half-day interactive workshops with groups of clinicians in an area, plus homework and a DVD between times, to progress beyond Bronze Level and in some cases then lead on to Gold and Accreditation. through better coordinated care, reducing hospitalisation. This includes the crucial involvement of GPs in care homes. make available more proactive, supportive care for carers and for bereaved people. Gold Standards Framework Accredited practices are presented with the Quality Hallmark Awards supported by the Royal College of General Practitioners and some of the results are presented in Figure 1 below,18 with some personal responses in Box 2 below. In light of the new Avoiding Unplanned Admissions Direct Enhanced Service (DES) (see text under heading below), this is even more relevant to encourage proactive care. The Silver programme particularly focuses on fulfilling the DES and managing to balance the demands of reducing admissions and providing better end of life care for the most vulnerable patients (for more details contact the GSF office info@gsfcentre.co.uk). conduct care planning discussions and reviews. review of possible admissions, including care-home residents. For the alignment of actions suggested in the Avoiding unplanned admissions DES (April 2014–15) and recommendations in use of GSF in primary care (GSF 'Going for Gold' Programme, achieved and evidenced by GSF accredited practices, see here) and Silver flyer (see here). Advance care planning (ACP) is a well-developed process of formalising the discussion with patients and their families to help determine their needs, wishes, and preferences for the future. It also includes discussions about refusal of treatments, do not attempt cardiopulmonary resuscitation (DNACPR), and a nominated spokesperson.20 Advance care planning is well accepted within the UK and other countries as the best way forward for all patients with serious, long-term illnesses, but especially for people nearing the end of life. Although such discussions may have occurred informally before, they may not have been recorded or communicated to others. So the offer of an advance care planning discussion for every appropriate person is now recognised as a key part of good care. Care planning is also included in the recent Avoiding Unplanned Admissions DES. is a key part of the GSF programmes,21 whereby every appropriate person is offered the chance to have an ACP discussion with the most suitable person caring for them. A good initial step can be to give patients an explanatory leaflet such as 'Planning your future care' (s ee here) to take away and discuss with their family, then book a further appointment when they are ready for the discussion. AS: we encourage all people to be given the chance to clarify their wishes, needs, and preferences in Advance Statements of preferences (AS). what don't you want to happen (ADRT, Advance Decisions to Refuse Treatments)? ADRT: some people may wish to describe specific medical interventions they don't want to happen, through ADRTs (e.g. DNACPR, or allow natural death [AND]). who will speak for you if you cannot (LPOA, Lasting Power of Attorney)? Proxy/LPOA: most people will also wish to say who might speak for them as proxy spokesperson or via legal LPOA. This is particularly important where development of future incapacity or dementia is anticipated. Gold Standards Framework website. Advance care planning. www.goldstandardsframework.org.uk/advance-care-planning (accessed 7 January 2015). Reproduced with permission. As an aid to this, there are a number of documents and tools available, including some developed locally. The tools follow similar lines: the actual tools matter less than the process, but the important thing is to have the discussion as part of the caring and therapeutic process. This is a sensitive, relationship-based discussion and it is advised that it is a planned face-to- face discussion and not undertaken over the phone nor pressurised, which with the recent DES tight deadlines has proved difficult for some practices. Advance care planning discussions open up a space in which such plans and reflections can be discussed, a place for contemplating future outcomes and eventualities within a safe environment in order to maximise life in the present. There can be a deeper significance to this discussion, in drawing closer to the person's sense of meaning and core values, to the way they make sense of the world and their inner life; and to enhancing not decreasing a sense of optimism, self-determination, control, and hope. For more information and examples, see the ACP section of the GSF website (see here) at or Thomas K, Lobo B, editors. Advance care planning in end of life care (Oxford: Oxford University Press; 2011). This document sets out the approach that should be taken in future in the care of all dying people in England. It focuses on achieving 'five priorities of care' (see Box 3 below), putting the dying person and their family back in the centre of individual, holistic care planning. These 'five priorities of care' are aligned with the existing NICE quality standard (QS13) for end of life care.5 Professionals will be expected, as part of best practice, to review the care they deliver for dying people against these five priority areas, and they will need to consider how they will demonstrate delivery of each of them for individual dying people and for those people who are important to them. The document contains information about the duties and responsibilities of healthcare and care staff (Annex D) and implementation guidance for service providers and commissioners (Annex E). This possibility is recognised and communicated clearly, decisions made and actions taken in accordance with the person's needs and wishes, and these are regularly reviewed and decisions revised accordingly. The needs of families and others, identified as important to the dying person, are actively explored, respected and met as far as possible. General Medical Council website. Five priorities for the care of dying people. www.gmc-uk.org/publications/25073.asp (accessed 7 January 2015) Reproduced with permission. The UK is regarded as the world leader in the delivery of good end of life care, according to the Economists 2010 'Quality of Death' index.24 We do well, but we know we can do better, especially for frail elderly people with conditions other than cancer who are living and dying in care homes or struggling to continue at home supported by intermittent home care. End of life care is a matter of life and death and important for all. This is one of the most satisfying areas of care for GPs—it can improve job satisfaction, reputation in the community, patient and family impact, team morale, and staff retention. But end of life care is also demanding, and we need to support and sustain staff to be able to deal with the significant burden it places on them in terms of time, effort, and human experience. We need both to take a broad view of population-based end of life care and to focus on personalised care for the individual, epitomised in the relationship-based advance care planning discussion described above. This is about helping our patients to live well until they die, and to die well in the place and manner of their choosing—life affirming, not death denying—while also striving to meet the challenges of the ageing population. And although Woody Allen says he doesn't want to be there 'when it happens', one thing is pretty certain—we will be! Plan care in line with preferences and reduce hospital admissions and deaths, enabling more to live and die at home. Local palliative care teams should look to craft local care pathways across secondary, community, and primary care, using the Gold Standards Framework as a basis.